About: In difficult circumstances, Charlotte Ward, once a famed stage actress, tries to restart her career--only to experience disaster. Against her better judgment, her estranged daughter, Rosalind, comes to her mother's rescue and moves her to a quiet English coastal village. Readers, I must confess I am not a huge fan of Historical reads, but occasionally certain authors strike me and forever hold my attention, and Lawana Blackwell is one of those authors. 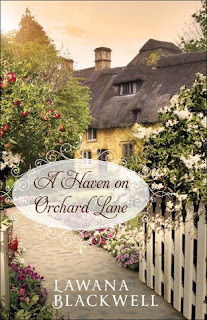 What she does with a Haven on Orchard Lane is breathtaking as she brings these characters to life. Rather than read the book, she takes you on an experience into a splendid Victorian world that you won't want to leave. Don't miss this book! It is definitely a 5-star read and worth every penny. Get out and get this book! You won't be sorry. Thank you to the publishers for providing me a complimentary copy for my honest review. I'm reading this book right now and so far enjoying it.